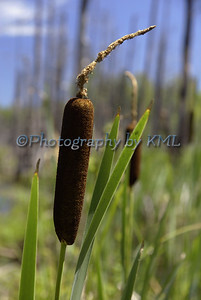 There were not too many of these cattails growing around the swamp. I was glad to see that the few that were there were close to the edge that I was standing on. And not too far in the water so I could get a good close-up of them. I remember when I was in girl scouts, many years ago, we learned that the pollen from these plants, at the right time of the year, could be used as flour. I always was amazed by that, but never had the opportunity to try it. It must produce quite a bit of pollen though as flour is usually used in measurable amounts. Hopefully we can back to the swamp to catch them in their next stage - all fluffed out. Did you guess what my "F" word would be this week? Since I had been posting about being at the fire works for the last few posts, it was just perfect to use one of the images for the "F" post. Now, I have tried in vain over the last few years to capture fireworks with my camera, but they have only been so-so at best. Well, this year I finally had some success. I'm am not sure exactly why, perhaps it was because we moved to new location to watch them - a bit farther away rather than right under them. Whatever the reasons, I was quite pleased with the results. 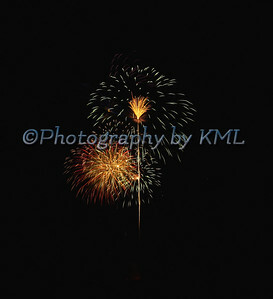 This was the first one of the night, and when I looked at it in the photo - it reminded me of a Tiki Torch. It didn't looked like this in real life though. The camera caught the trail of the firework as it was shooting upwards, and I must have stopped taking the photo at just the right time to catch the explosion before it completely burst out. Kind of cool, I think, and in the next post I will explain how I actually took the photo and the settings I used. 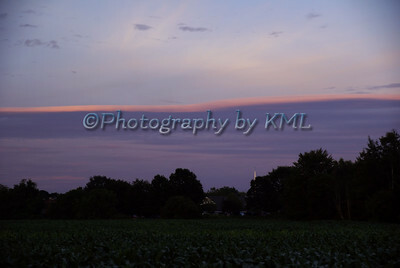 Last week's post showed the beautiful pink lined clouds opposite the setting sun. But the real show was going on behind me. 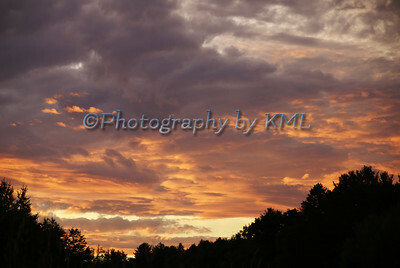 Once again, the photo just does not show the vibrant colors that Mother Nature was painting across the sky. The fiery pinks were a perfect contrast against the muted purples. The clouds were all lit up from the sun on the underneath and it really was spectacular. I was sitting in my chair when I snapped the photo, and there were a few strands of tall grasses that were quite blurry in the foreground. Quite an eyesore they were, and it took quite a bit of time in photoshop to remove them. Time consuming, but so worth it in the end. Hope you enjoy this little corner of my world, my friends! The image in my previous post was taken in the same location as this one - only it was about an hour later. I took this one just as we arrived at our "spot" to watch the fireworks display. The golden evening light was slanting across the sky and lighting the trees beyond the cornfield. Early morning and evening are my favorite times for taking photos. The light is less harsh and sometimes it can really give a delightful atmosphere to an ordinary scene. And the wind is just about always calm - making macro images easier as they aren't moving around. Of course since the light isn't as strong, a tripod is usually needed to capture those macros. I didn't get any macros that evening - sitting in your seat and keeping the view clear in front of oneself was the main objective to arriving early for this good "spot". We really enjoyed it, and I bet you can probably guess what "F" will be next week! While waiting for the fireworks a couple of weeks ago, the sun was making a glorious departure from the sky. It was setting behind me, but it was casting such gorgeous color on the clouds in front of me. The photo can hardly do it justice - the colors were so bright and vivid. 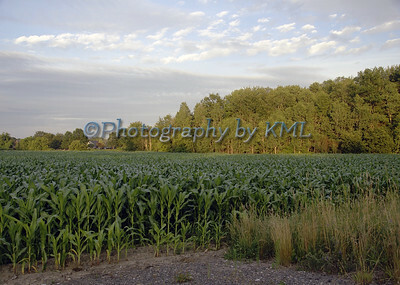 We were set up right beside a cornfield, and the corn was about waist high at the time. There is a church steeple in the distance that is just barely visible behind the trees in this small image. It was such a pleasant evening - a few bugs, but not chilly at all. I have an image of the clouds behind me that I can't wait to post next time. Don't forget to come back - it will be so worth it! A very common word for the letter D - dog. He was not easy to capture at first. This Beagle dog was in a new place, and he was following his nose everywhere. 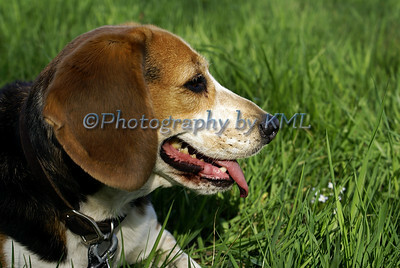 After about a half an hour, he was more than ready to take a break in the soft grass. That was the perfect time for me to grab a few shots of him. A friend was dog-sitting him, and that was the only time I ever saw him. I am not usually around dogs, so I am glad he was gracious enough to pose so nicely for me to photograph him. A couple of weeks ago, I wrote on one of my other blogs about a loon at the lake. An experience that will probably never happen again, but I am now prepared if it or any other water experience comes along. 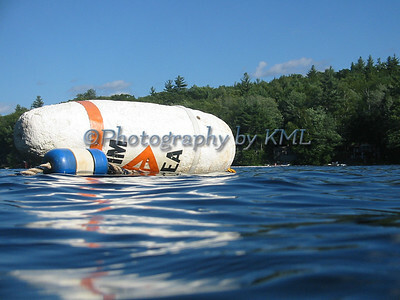 See that buoy floating above? It is about 150 feet from shore. How did I get so close to it at that water level angle? Well, I have a new toy, or rather an old toy that is new to me. It is an older Canon Powershot camera, really tiny, and it has it's own underwater case. The largest image it can take is only 2 megapixels, and the quality is not like a DSLR, but it is a lot of fun. And I can take it swimming with me. So when those moments arrive when we are in the water, I am prepared to capture them! Last week's post was a bean blossom from the garden. This week's post is from the garden too. 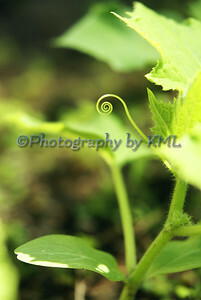 I caught this delicate little vine of a cucumber plant in the early morning - curled up beautifully. By lunchtime, it was stretched out straight, looking for something to hang onto. Since this photo was taken we have enjoyed the delicious cucumbers these plants have produced. Many blossoms and tiny cukes are still coming so we should be enjoying them for quite a while!